Lake Park Arts District, Kelsey Cares, Inc. 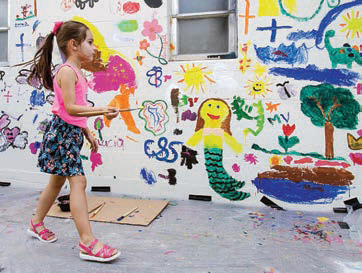 Most are familiar with the CANVAS Outdoor Museum Show that began in West Palm Beach in 2015; the free outdoor performances; and the many murals peppering the city by artists like Eduardo Mendieta, Anthony Hernandez, and Karen Bowman. “We started doing street art with local artists, and suddenly international artists wanted to come here,” says Clemente. The DDA has also embraced the written word, installing “short story machines” around the city, where patrons can push a button and be gifted with one of 50,000 stories to read. “It’s your experience, and you can keep it to yourself or choose to share it with others,” says Clemente, who plans to expand the program by collaborating with a local writers guild to include more personal stories around issues like equality. “We want to build our own narratives,” he explains. “When people can tell their story—how they made it, their favorite childhood spot, etc.—and share it with others, it helps people connect. And that makes the community more valuable and special.” Clemente adds that a short-story festival is planned for January, where an announcement about another new project, tying those stories to visual art, will be unveiled. The public art trend is certainly not new. There are more than 600 such programs in the United States and approximately 60 in the state of Florida alone. The first was administered by President Franklin Roosevelt as part of the New Deal, with artwork commissioned by federal buildings to help build morale, create jobs, and reduce crime. Today, public art in urban environments has a trifecta of beneficial results: It’s educational, helps boost the local economy, and provides a distinctive brand identity for a community. 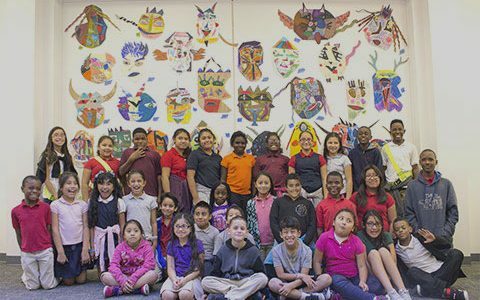 Art can be a city’s way of putting forth to the world what it represents—a very important distinction, particularly for South Florida communities that are still growing. 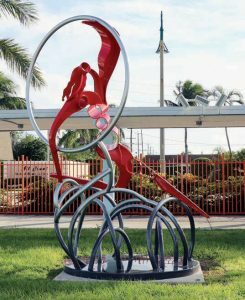 “People are moving from different parts of the country and the world to South Florida, and they’ve had public art around them their whole lives,” says Debby Coles-Dobay, public arts manager for the City of Boynton Beach, which is home to more than 75 public artworks as well as special events like the biennial International Kinetic Art Exhibit and Symposium in February. “In places like New York, Chicago, and Boston, public art is prevalent. 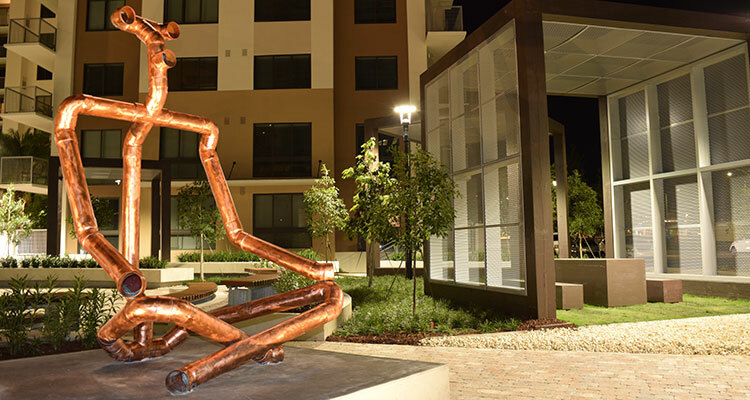 It’s part of the quality of life.” Programs like Boynton Beach’s Art in Public Places can help draw new residents. Recently, the city scored an amazing partnership with renowned artist Albert Paley, who has a yearlong exhibition around the city featuring several outdoor sculptures (read more about this exhibit on page 22). The Back Alley Mural Festival in Tequesta. Photo by Craig Houdeshell. 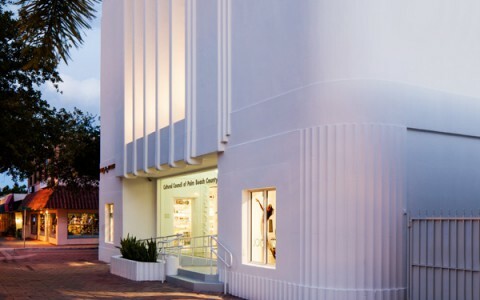 Lake Worth is well aware of the power art can have in boosting the local economy. The city is enticing people to consider investing in the area by beautifying its streets. “What sets Lake Worth apart from other areas is its diversity,” says Joan Oliva, executive director of the Lake Worth Community Redevelopment Agency. 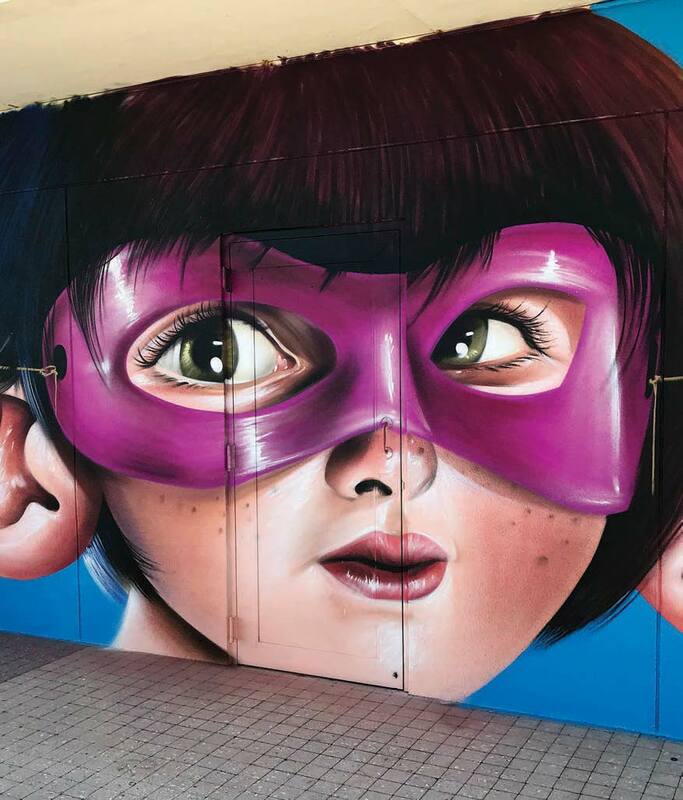 “The many different ethnicities, lifestyles, and cultures here help make our public art eclectic and unifying.” As part of its art initiative, the city has been revitalizing buildings with paintings and more since 2011. 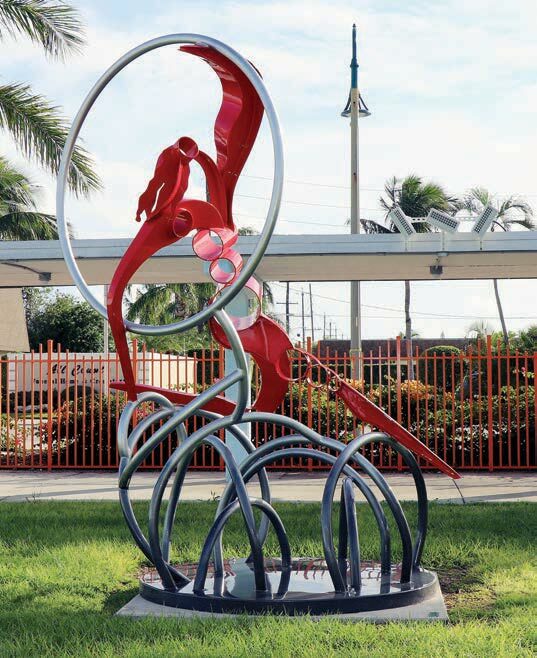 On Lucerne Avenue, three sculptures by local artist Claudia Jean Klein currently stand in the open space at Hatch 1121, the new home of LULA Lake Worth Arts, with a new mural in the works for one of the building’s walls. 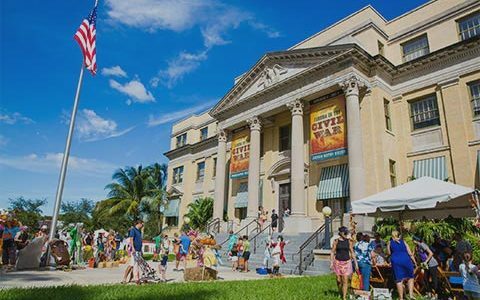 And this year, the city is reaping the benefits of the CANVAS Outdoor Museum, which expanded to Lake Worth last fall—an event that has brought more than $700,000 a year in revenue to downtown West Palm Beach in the past, according to CANVAS founder Nicole Henry. 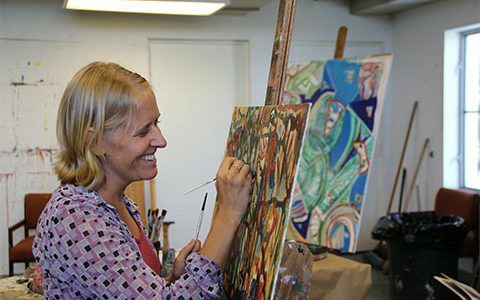 In Lake Park, businesses like The Brewhouse Gallery have long been a part of the public art movement and the community on the 700 block of Park Avenue known as the Lake Park Art District. The craft beer and music venue has helped revitalize the area by bringing awareness and increased foot traffic to the neighborhood through the use of public art. Aside from showcasing emerging artists on its walls, the establishment’s exterior is a canvas itself: Last year, owner A.J. Brockman raised money to commission a series of murals along the backside of the 700 block. Celebrated in phases during the Back Alley Art Festival, the project includes work by several well-known street artists, such as Craig McInnis, Amanda Valdes, Anthony Hernandez, Mark “Bulks” Rupprecht, Steven Marino, Mikey Goodman, and Eduardo Mendieta. Being an economic driver and creating an identity are reasons enough to support public art, but for Brockman, it’s about more than that. “At the end of the day, as long as the art creates any form of discussion, it has done its job,” he says. 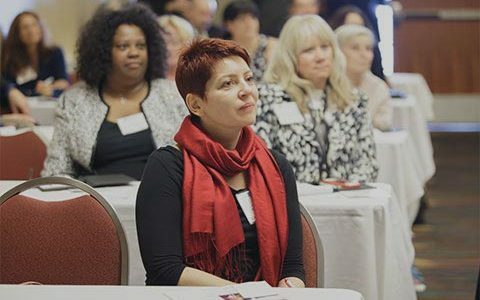 Because the art is delivered in an environment outside of museum or gallery walls, people of any social or economic background are able to enjoy it and engage in civic dialogue. Positive or negative, what matters is that people are reacting. It’s a conversation that is happening all across the county, with every community embracing the trend. Lake Worth has been running the beloved Street Painting Festival since 1995. Tequesta’s Lighthouse ArtCenter celebrated the third anniversary of its popular Back Alley Mural Festival in November. Jupiter has had one of the world’s leading street artists leave his mark in town, as Shepard Fairey recently painted a mural at Jupiter Community High School. 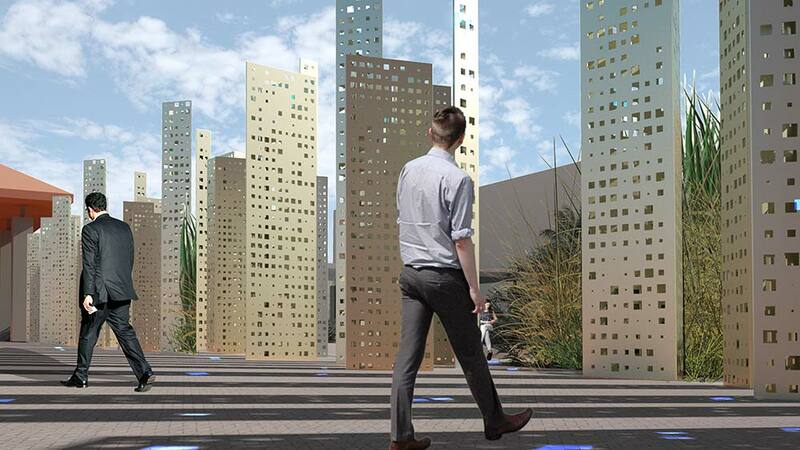 The project is part of the Perry J. Cohen Foundation’s multifaceted wetlands project led by Pamela Cohen and Art Miami founder Nick Korniloff. And in Palm Beach Gardens, the city implemented an artistic program around an everyday structure, its bus shelters, hiring artist Mark Fuller to design garden-themed shelters around town. Art in Public Places is now working on transforming the underutilized courtyard at the Palm Beach County Convention Center through light design. 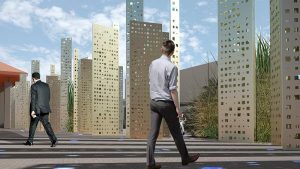 Led by Los Angeles–based artist Susan Narduli, in collaboration with internationally recognized lighting design firm Horton Lees Brogden, an installation called Light PLAY will be unveiled in late spring/early summer 2018. The signature artwork involves sculptural screens that will visually block vehicular traffic and create a sense of seclusion at the center. Playing with light, the work will attract the sun and moon, creating changing shadows and transforming the space from day to night. “Firefly” light, explains Narduli, will recall nighttime adventures in the Palm Beach County wetlands. “We are extremely excited about this initiative, which will transform our courtyard into a picturesque scene and allow our clients to experience Florida’s beautiful weather and bask in everything we have to offer,” says convention center General Manager Dave Anderson. The company’s plan involves many new projects (all in motion at press time), including: the painting of Hibiscus Garage by Francis Chihi; the addition of sculptures throughout the area; and new artwork at the Hilton. 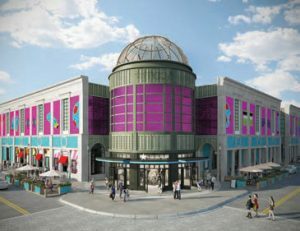 One major element involves the former Macy’s building on Rosemary Avenue and its transformation into “The Culture Lab.” British conceptual artist Michael Craig-Martin is creating his largest painting to date—Palm Beach Parade—around the entire exterior facade of the building, while a sound installation by Stephen Vitiello creates an immersive arts experience. Also in conversation, and in collaboration with the city of West Palm Beach, is a street mural by Steed Taylor that would begin at Okeechobee Boulevard at the entrance of CityPlace and continue the length of Rosemary Avenue to Clematis Street, concluding at the Sunset Lounge. Also in CityPlace, luxury home furnishings giant Restoration Hardware revealed its 80,000-square-foot, four-story design gallery in November. The space includes a rooftop restaurant amid tropical gardens, a 12-foot-tall cascading wall of water, and an eastern facade painted with ancient text-based imagery by Los Angeles–based artist Retna. 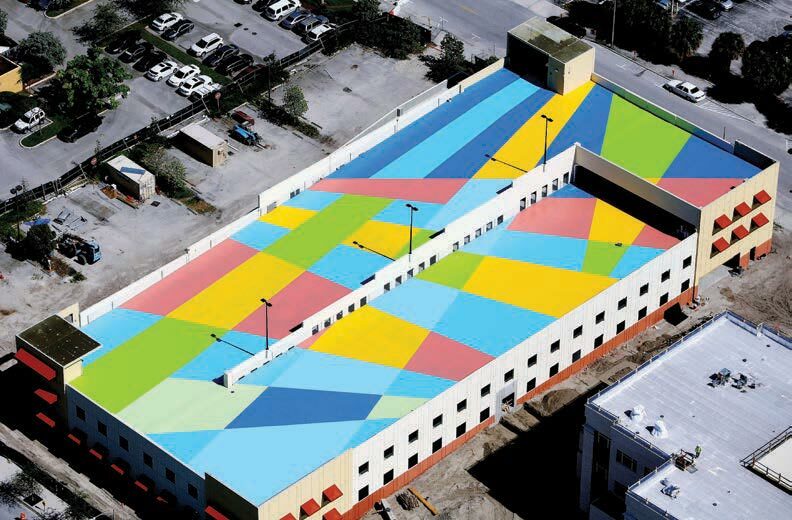 A rooftop mural by Cecilia Lueza on Florida’s Fourth District Court of Appeal. 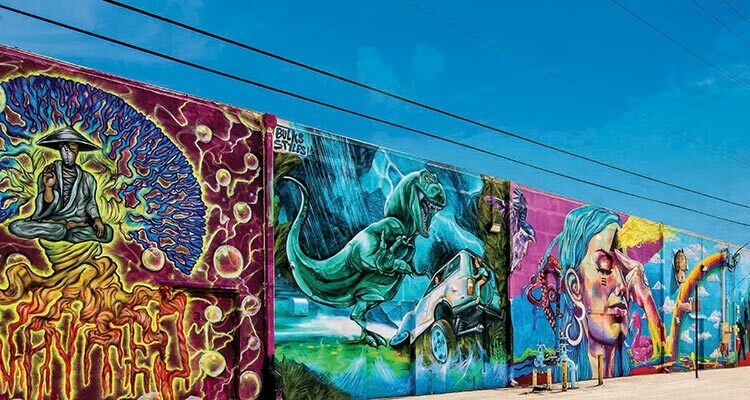 From city program managers to nonprofit groups to private businesses, it seems everyone agrees public art is essential to the growth of Palm Beach County. Even government buildings, just as they did nearly a century ago under Roosevelt, are getting an artistic makeover: In collaboration with construction group The Weitz Company, the Fourth District Court of Appeal in West Palm Beach beautified its parking garage with a lively piece of art. 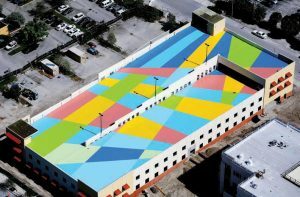 A striking painting on the 21,600-square-foot rooftop by Argentine-born artist Cecilia Lueza explores the visual effects of color and geometry.